Yoshihisa Yamada updated the status of tranlation project of "Habu Yoshiharu and Modern Shogi"
Yoshihisa Yamada updated the status of translation project of "Yoshiharu Habu and Modern Shogi" into other languages than English. Kimura won the 2nd game. The socre after it is tied in 1-1. Here is the duplication of my twitter entries about the moves of the game. Here is the link. The score before the game is 1-0 led by Kisei Habu. The allotted thinking time per player is 4 hours and less than 60 seconds per move after consuming it. The venue is at Hotel New Awaji in Aawajishima, Hyogo prefecture. Yauchi beat Iwane in the 1st game. The score after it is 1-0 led by Yauchi. Here is the duplication of my twitter entries about the moves of the 1st game. 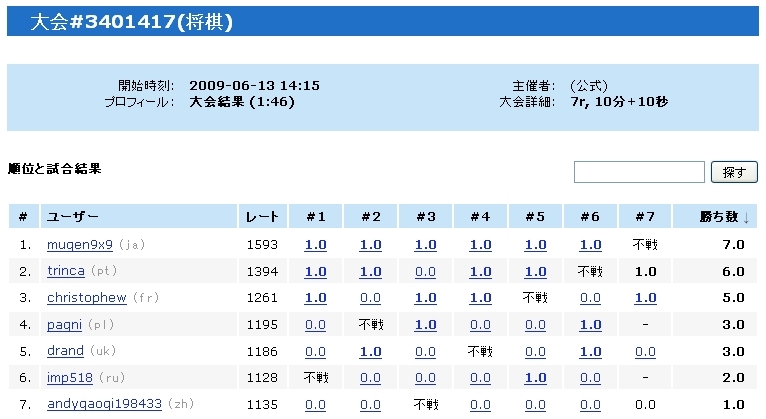 Mugen9x9 is the winner of the captioned on-line shogi tournament held on June 13, 2009. Here is the link to the result. And frequetly-updated webcamera lives are available to watch here. The allotted thinking time per player is 3 hours and less than 60 seconds per move after consuming it. It will end around 17:00(Japan time). Habu bead Goda in 131 moves in the 6th game of 67th Meijin-sen. The score is 3-3 after the game. Here is the duplication of my twitter entries about the moves after the supper break. It went from 35th move to 83th move before the supper break. Here is the duplication of my twitter entries about them. Sent is Meijin Habu while Gote is 9-dan Goda. They say Habu led the position in the morning but it's goint to be a close game now. The venu of the game is Higashi Honganji. Here is the duplication of my twitter entries about the day 1 of the 6th game of 67th Meijin-sen best of seven match between Meijin Habu Yoshiharu and 9 dan Goda Masataka. In this game, Habu is the Sente player. 34 moves were played yesterday. Goda played P-8d at the 2nd move, but it turned out to be a fake. He chose faint ranging Rook. Goda leads the score in 3-2 before the game.